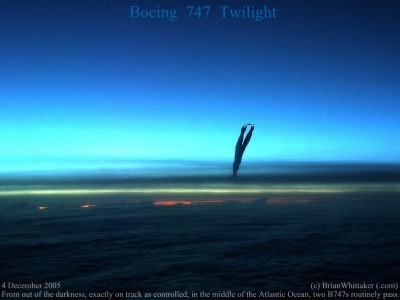 From out of the darkness of evening twilight, within seconds, two B747 routinely pass with a closing speed of approximately 1900 kilometres per hour. Modern navigation equipment means both aircraft are exactly on track, often within inches, while in the middle of the Atlantic Ocean as directed by Oceanic Air Traffic Control. December 4, 2005. [Image 800x600].